Sounds like a good idea to me, Jen! I was fairly confident about the whole thing (or at least not stressed) until I begain reading some meringue “tales of woe” on the DB blog. Reports of shrinking meringue (the meringue pulls away from the crust after baking) or weeping (a watery layer fors between the meringue and the curd) got me a little nervous, nor was I thrilled to hear about lemon curds with a soupy consistancy. She further advises preparing the meringue BEFORE the filling, so it’s ready to go when the filling is nice and hot (this differs from the DB recipe, which directs you to spread on the meringue after the curd has cooled). Corriher also mentions that a colleague even sprinkles fine cake crumbs over the surface of the curd before spooning on the meringue. The crumbs absorb any moisture, but you can’t detect them when you eat the pie. But the taste? Really wonderful. The curd (which was a little loose, but I think that was completely my fault for not vigorously whisking the mixture for the entire time) was packed with lemon flavor, but not so much so that it fell into “Sour Patch Kid” territory. The meringue was light and lovely, and along with the crust, balanced the acidic notes in the curd nicely. 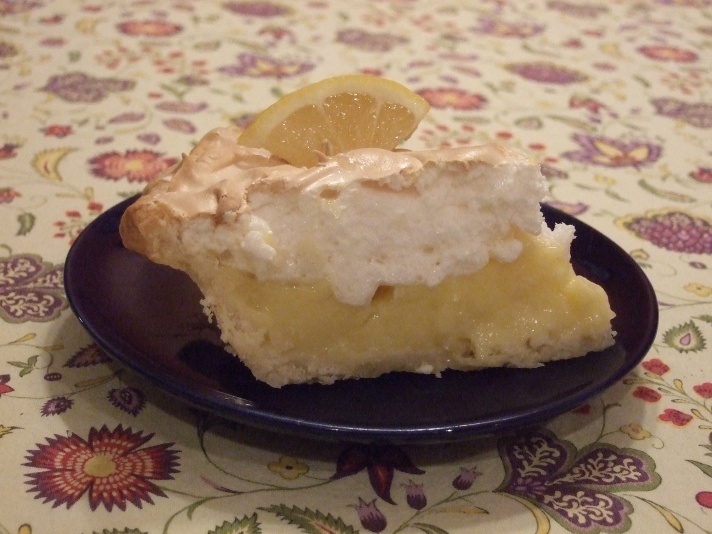 So, all in all, I would make both the crust and curd again, but to cut down on weeping and shrinkage, I’d try Corriher’s meringue recipe; see the end of this post for her recipe. Additionally, I’d use a smaller pie plate — there was a lot of “head room” left for my curd on the 10-inch dish, nor did the meringue look as impressive as it could have (as it was partially “buried” beneanth the top of the pie plate). Big thanks to Jen for hosting! Check out scores of other Daring Bakers via the Daring Bakers Blogroll. Allow the dough to warm slightly to room temperature if it is too hard to roll. On a lightly floured board (or countertop) roll the disk to a thickness of 1/8 inch (.3 cm). Cut a circle about 2 inches (5 cm) larger than the pie plate and transfer the pastry into the plate by folding it in half or by rolling it onto the rolling pin. Turn the pastry under, leaving an edge that hangs over the plate about 1/2 inch (1.2 cm). Flute decoratively. Chill for 30 minutes. Shirley O. Corriher’s Meringue (via this link). This is NOT what the DB challenge used, but what I plan to try in the future. Stir the egg whites, 2 tablespoons water, cream of tartar and sugar together well to break up whites in a medium-size stainless-steel bowl. Heat 1 inch water to a simmer in a medium skillet and turn the heat off. Run a cup of hot tap water; place an instant-read thermometer in it. Place the metal bowl of egg white mixture in the skillet of hot water and scrape the bottom and sides of the bowl constantly with a rubber spatula to prevent the whites from overheating. After 1 minute of constant scraping and stirring, remove the bowl of egg whites and place the thermometer in the whites. If the temperature is 160 degrees, beat until stiff peaks form when the beater is lifted from the mixture and the mixture slides only slightly when the bowl is tilted. (Peaks are stiff if the tips stand straight. If they bend over at the top, they are ”soft” peaks). If necessary, keep heating the whites 15 seconds at a time until they reach 160 degrees. Rinse the thermometer in the skillet to kill salmonella and return it to the cup of hot water after each use. Sprinkle cornstarch into a small saucepan, add 1/3 cup cool water and let stand 1 minute. Then stir well to form a paste. Bring the mixture to a boil, stirring constantly. The mixture will be thick and slightly cloudy. Let it cool for a couple of minutes, then whisk 1 to 2 tablespoons of the cornstarch mixture into the meringue and continue adding and beating until all is incorporated. Whisk in the salt and vanilla (if using). Pour over pie filling, pushing all the way to the crust to form a seal over the filling. The meringue tops one 9-inch pie.